Fremantle Prison and St Matthew's Anglican Church will appeal to history buffs. Do some cultural sightseeing at Western Australian Maritime Museum and The Shipwreck Galleries. Explore the numerous day-trip ideas around Perth: Fremantle (Bather's Beach, South Beach Recreation Reserve, & more), Olive Farm Wines (in Millendon) and Talijancich Wines (in Herne Hill). And it doesn't end there: look for all kinds of wild species at Caversham Wildlife Park, admire the natural beauty at Kings Park & Botanic Garden, admire the masterpieces at Art Gallery of Western Australia, and head off the coast to Penguin Island. To find traveler tips, ratings, other places to visit, and other tourist information, read our Perth road trip planning app . If you are flying in from United Kingdom, the closest major airport is Perth International Airport. 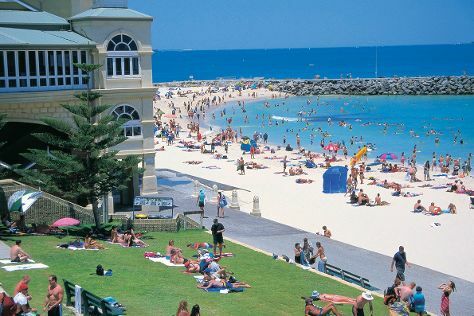 In December, daytime highs in Perth are 35°C, while nighttime lows are 17°C. Wrap up your sightseeing on the 15th (Sat) early enough to travel back home.